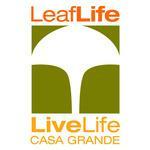 Leaf Life is a State of Arizona approved Medical Cannabis Dispensary dedicated to providing natural leaf based remedies in a clean, relaxed and open environment. Our patients are given our full attention and the utmost respect to feel welcome. The staff is here to assist you in choosing your medicine, leaving you with a positive experience, we are determined to educate and support you through your condition/rehabilitation. The Gingo leaf represents our brand because its a symbol of strength and longevity. The ginkgo tree is the oldest prehistoric living tree still growing on the planet, fossils that are over 270 million years old have been found.